It’s funny – it seems that the instant that summer ends and fall begins, we immediately begin to crave the comfort of warm, rich, homemade soup. It could be just about any kind of soup, from old-fashioned chicken noodle to a steaming bowl of fiery chili, as long as it’s hot and it’s good. This intriging recipe for Smoky Butternut Squash and Cacao Soup, adapted from author, scholar and restaurateur Maricel E. Presilla’s encyclopedic cookbook of Latin American recipes, Gran Cocina Latina, hits all the right notes for a consummately satisfying autumn soup; spicy, smoky, savory – with a rich and mysterious hint of subtle sweetness. 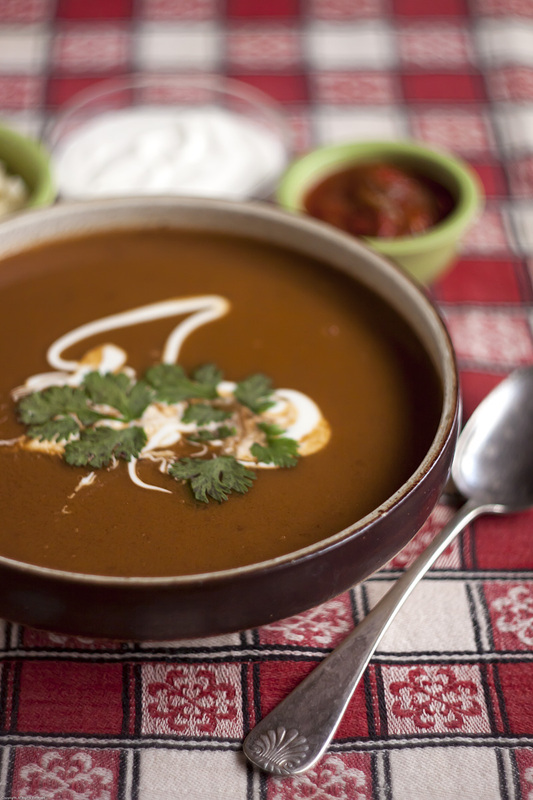 The soup is set apart by its use of a true Latin American ingredient, chocolate – or more properly, cacao. While we Norteamericanos typically think of chocolate as an ingredient reserved for desserts, candies or sweet beverages, its raw ingredient, cacao, is an important element in many Latin American dishes, both sweet and savory. 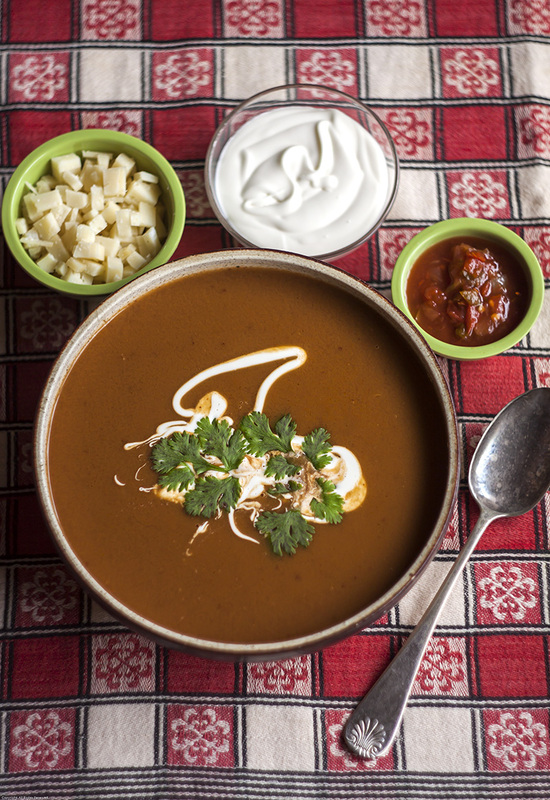 This rich, spicy soup blends the flavors of butternut squash, smoky chipotle chiles and chocolate, utilizing both unsweetened cacao nibs, the roasted & crushed fermented cocoa beans used in the production of chocolate, and deep, dark bittersweet 65% chocolate. Like most soups, we found it even better when reheated the next day. Using a vegetable peeler, peel the squash. Scoop out the seeds with a large spoon. Chop into 1 inch pieces, put into a bowl and set aside. Heat a skillet or grill to medium heat. Add the tomatoes, onion and garlic and roast, turning occasionally, until the tomatoes are blistered and the onion and garlic are charred in spots, about 10 minutes. Remove to a plate and set aside to cool slightly. Put the tomatoes, onion and garlic in a food processor, add the chipotle chile (seeds & all), allspice, cinnamon, fennel seeds and cacao nibs, and process until smooth. 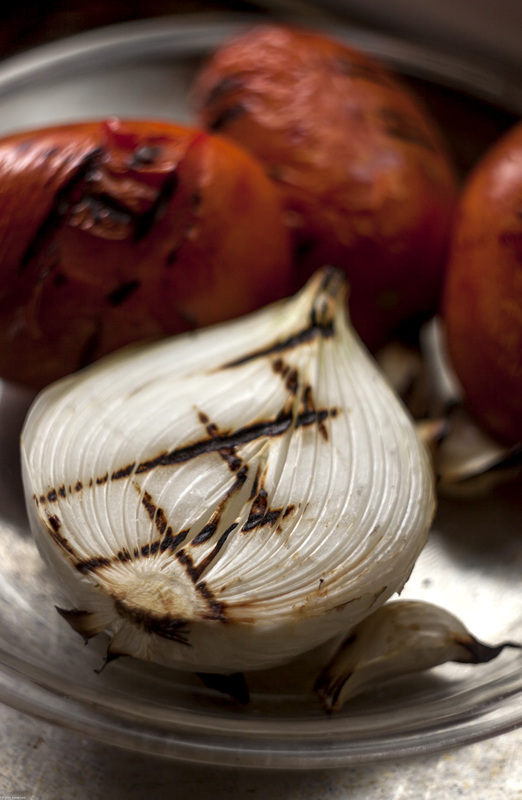 Heat the olive oil in a medium sized heavy pot over medium heat until the oil is sizzling. Carefully add the puree (watch out for hot spatters!) and stir in the brown sugar. Cook, stirring constantly, for about 5 minutes. Add the chunks of squash, then pour in the chicken stock and bring to a boil. Reduce to low and cover. Simmer until the squash is tender, about 15 – 20 minutes. Remove from the heat. Puree the soup with a immersible hand-held blender, or in batches using a food processor or conventional blender. Pour the resulting puree through a fine mesh strainer, forcing it through with the back of a spoon or ladle. Discard any remaining solids. Heat the strained soup over medium heat. Stir in the chocolate, stirring until it melts. Remove from heat and adjust seasonings to taste. Ladle into bowls and serve with a dollop of crema and a scattering of the diced Manchego cheese. For additional flair & flavor, add a spoonful of salsa and a sprig of cilantro to the top. Variations: For a thicker soup, reduce the stock to 6 cups. 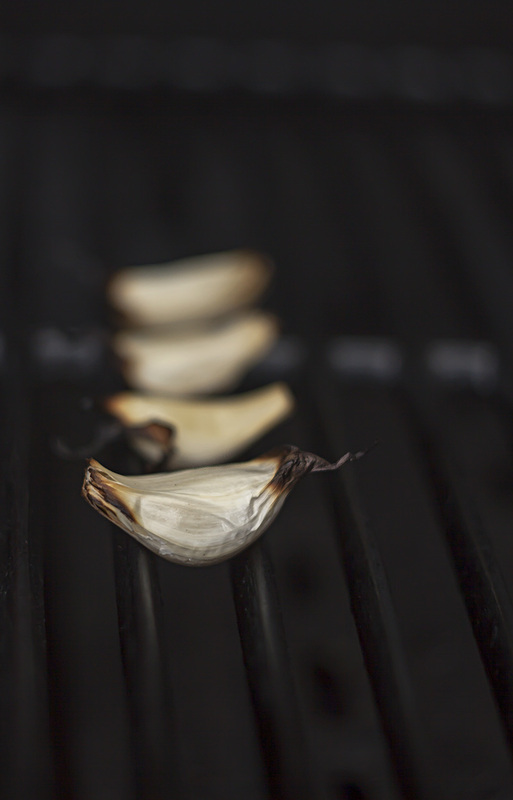 For even more smoky flavor, add 1 tablespoon smoked paprika. Loving loving this idea. Squash and cacao who would think it. Definitely going to try this!